Curl Up by Gabor is a spiral curled, mid length bob with an eyelash bang and a 100% hand-tied lace front. 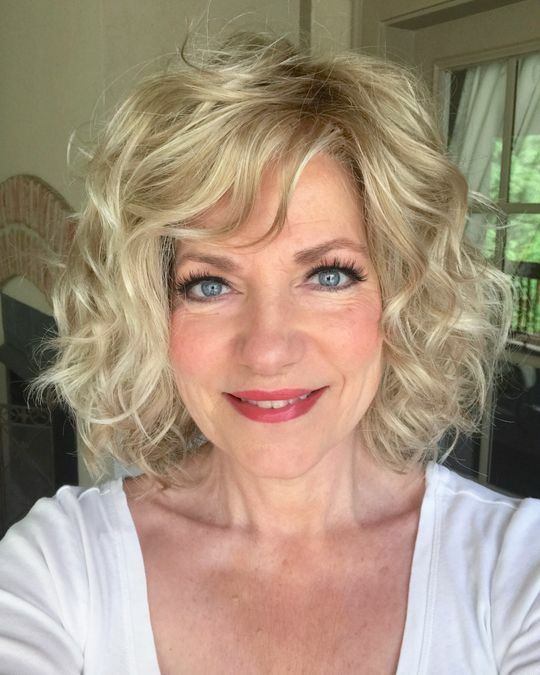 Curl Up by Gabor is a collar length, all over layered bob with tons of spiral waved curls that can be scrunched for more fullness or gently brushed into soft waves. The eyelash bang adds a subtle frame to emphasize the eyes and the temple-to-temple, 100% hand tied lace front allows for off-the-face styling. Gabor's Personal Fit cap construction includes a resilient stretch material throughout the cap base for a custom-like fit, open ear tabs, open extended nape, and a wide velvet comfort band to prevent friction. mustang s. Reviewed by mustang s.
I like the curl pattern on Curl Up and the color is very nice, but the fibers are coarse and very stiff. Kym F. Reviewed by Kym F.
I chose badly on this one. It's a beautiful wig and, as usual, it's made very well but I simply chose badly for my face and age. I can wear it with a hat though. Looks great with a hat. Hollis R. Reviewed by Hollis R.
Curl Up is neither a great wig nor a horrible one...but if you have become accustomed to a deep lace front and appreciate that feature, this wig will leave you disappointed. I did realize that the price was lower than what I normally would pay, but upon trying it on, I realized that I can not give up the higher end features. The pros are its curl pattern...love the all over big beachy curls. The root was dark enough and a pleasant color. Now I have had several Gabor wigs in the past. All of them had nice hair fibers( though they are on the medium denier vs fine that I prefer) This Curl Up has very coarse fibers that tangle. Right out of the box ends were frayed with a couple of kinks in the curls and I couldn't run my fingers through her at all. The knots on the lace front were on the large side and many were loosely knotted. I’ve never had a bad lace front on a Gabor wig before so that was disappointing. I used JR’s detangler and Simply Stylin silicone spray on her and retwirled all the curls and now I ‘m pretty happy with the way she looks. I also thinned her bangs a liitle. Overall I love the style and curl pattern and length but had to do a lot to her to make her look good hence between that the bad lace front and coarse fibers I gave her 3 stars. Lara M. Reviewed by Lara M.
I felt like I was wearing a very tacky costume wig. The texture was course and wiry, the bangs are hideous. I will say that the color was quite pretty though, so one star for that, lol. This is definitely not what I would have expected from Gabor. They need to go back to the drawing board on this one, imo.